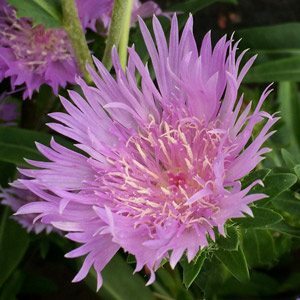 With large fringed flowers Stokesia laevis is a clump forming evergreen perennial originally from the southern states of the USA. The flowers face upwards and are wonderfully open making a great display from summer through to autumn. In the garden Stokesia laevis works well in the mixed border or as a part of a cottage garden, also useful as a ‘filler’. Frost tolerant, coping well with seaside conditions and generally pest free makes this a useful garden plant. Generally not a good performer in damp humid conditions so not one for the tropical areas. Is it really evergreen ? Yes is warmer climates it is, however in cooler areas the foliage tends to look a little ragged in winter and gardeners often do a ‘tidy up’ by pruning back hard. Pruning back also helps revitalize the plant and keep it bushy, this is also a great time to weed around the plants and apply mulch. Although this is a hardy plant it grows best in a humus rich moisture retentive soil. Full sun to part shade with flowering more prolific with good sun. Fertilizer should be applied in spring and again in late summer, a general purpose slow release type is usually sufficient although we do recommend mulching around Stokesia laevis with some well rotted compost in early spring. Pruning is generally not required although plants can be deadheaded after flowering to promote a second flush of growth. Stokesia laevis ‘Rosea’ is the pink flowering form. Stokesia laevis ‘Blue Danube’ has blue to mauve flowers. Stokesia laevis ‘Blue Moon’, very attractive blue flowers. Stokesia laevis ‘Blue Parasols’, flowers are a lilac blue.